The sauna door is a much more important part of a sauna than most people think. It is absolutely imperative that doors do not lock for safety issues. The optimal size for a door is 24” x 72” although some doors can be as big as 36” x 80”. It is important that the door opens outward while most doors also have windows on them in order to see the control panel on the outside. Windows can also provide a view of scenery for outdoor saunas. Benches are typically 19”-20” wide with the length obviously being dependant on the size of your sauna. The most effective type of wood used for sauna benches is Western Red Cedar. The reason for this is because cedar wood doesn’t discolor in the same way that many other woods do while it is also a better option for long term stability. It is generally recommended that both the upper and lower benches are also covered with sealant to ensure optimal durability and quality. Almost all modern saunas have control panels that provide information about the time remaining and temperature of the sauna. These controls will generally allow you to raise and lower the temperature, change the time, and also switch the sauna heater on and off. These panels will generally cost in the $100-$200 range, although more sophisticated options can cost even more. Sauna rocks are an important part of the sauna experience as they create the steam that is generated when water is poured on them – a process which is also known as loyly. Volcanic rocks are widely considered to be the best type of sauna rocks as they have the ability to withstand the many heating and cooling changes that take place when the sauna is in use. While other rocks can be used, it should be noted that not all types of rocks will successfully be able to withstand the potentially 950 degree temperatures that are created by the heater. Flooring is also an important part of sauna construction as choosing the wrong type of flooring can cause significant headaches in the long run. 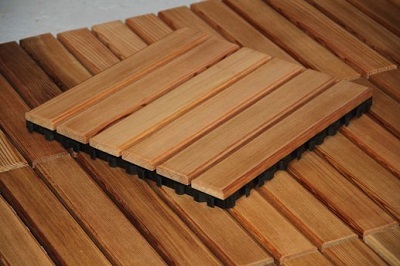 Ipe wood and cedar tiling are the most common types of flooring used for saunas. It may be in your best interest to purchase an inexpensive sauna wood sample pack in order to help you make the best decision on what type of flooring you would like to use. The thermometer and hygrometer are essential parts of the sauna as they give users an idea of the temperature and humidity level within the sauna. Almost all thermometers and hygrometers will fill this need although you’ll want to be that each can read higher temperatures and humidity levels.